Just like that bunny on TV with the battery! 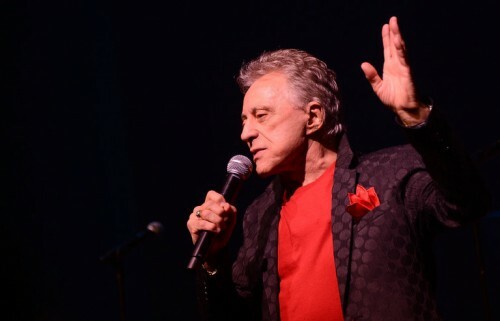 Check out the BIG Frankie Valli news today on BroadwayWorld.com! The legend is back! Eva Price and Live Nation have just announced that Frankie Valli’s triumphant sold-out Broadway debut in Frankie Valli and the Four Seasons On Broadway! will return for a strictly limited 7 performance engagement from Friday, October 21, 2016 through Saturday, October 29, 2016 at the Lunt-Fontanne Theatre (205 West 46 Street). In a non-stop career of entertaining audiences across the globe Frankie Valli will return to Broadway for an intimate concert celebrating his award-winning, critically-acclaimed, record-breaking career as a solo artist and with the Four Seasons. Frankie Valli and the Four Seasons On Broadway! will feature all of their greatest hits and Mr. Valli’s solo hits including “Sherry,” “Big Girls Don’t Cry,” “Walk Like A Man,” “Dawn (Go Away),” “Rag Doll,” “Bye, Bye, Baby (Baby Goodbye),” “Let’s Hang On!” “Working My Way Back To You,” “Can’t Take My Eyes Off You,” “Grease,” “My Eyes Adored You,” “Who Loves You” and “December ’63 (Oh What A Night),” along with a variety of musical surprises. Frankie Valli will be releasing Tis The Seasons, his first holiday album in decades, this fall on Rhino. Full details will be announced in the coming weeks. Valli has never stopped performing and continues to tour internationally. Frankie Valli and the Four Seasons On Broadway! plays Friday, October 21, at 8pm, Saturday, October 22 at 8pm, Sunday, October 23 at 3pm, Tuesday, October 25 at 7pm, Wednesday, October 26 at 2pm, Friday, October 28 at 8pm and Saturday, October 29 at 8pm. Tickets, ranging in price from $65 – $165, can be purchased through www.ticketmaster.com (877-250-2929). For more information, visit www.FrankieValliBroadway.com. Beginning Wednesday, July 27, 2016, at 10:00am (EST) for 48 hours only (through Friday, July 29,, 2016 at9:59 a.m.), tickets for Frankie Valli and the Four Seasons On Broadway! will be available exclusively toAmerican Express members. Beginning Friday, July 29, 2016 at 10:00 am through Sunday, July 31, 2016 at 10:00 pm tickets for Frankie Valli and the Four Seasons on Broadway! will be available exclusively to Audience Rewards, Live Nation,Ticketmaster and AAA members. Tickets for Frankie Valli and the Four Seasons On Broadway! will go on sale to the general public on Monday, August 1, 2016 at 10:00am at www.ticketmaster.com (877-250-2929). Frankie Valli and the Four Seasons On Broadway! is produced by Eva Price and Live Nation. This mans career has gone on forever!!!! What an inspiration for all and you go Mr. Valli! Who else has been on the charts longer than Frankie Valli? He gas been on the billboard charts since 1956 and in billboard magazine since 1954! Good luck, be healthy and much more success to you, just amazing. See you in Orange County tomorrow and I’m sure you will put on an amazing show as always.